Wholesale Stainless Steel Bottle Stoppers Blanks Kits Wholesale Teardrop Bottle Stopper Kits. Premium Quality stopper. 25mmx70mm stopper blank. Chrome plated over Zinc alloy. M8 threaded opening in center. This item does not come with screw. Premium Quality stopper. 25mmx70mm stopper. Chrome plated over Zinc alloy with 8mm removable screw. Premium Quality stopper. 25mmx70mm stopper. 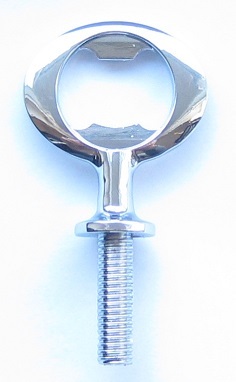 Chrome plated over Zinc alloy with 3/8"-16TPI removable screw. **** Polished Premium Quality 18-8, 304 kitchen food grade Stainless Steel stopper body only. NO threaded opening / flat top. 22mmX52mm main body. **** Polished Premium Quality 18-8, 304 kitchen food grade Stainless Steel stopper body only. M8 threaded opening in the top center. 22mmX52mm main body. **** Polished Premium Quality 18-8, 304 kitchen food grade Stainless Steel mini cone stopper (with UN-removable 3/8"-16TPI screw) 65mm total length. ****Polished Premium Quality 18-8, 304 kitchen food grade Stainless Steel stopper (with removable 3/8"-16TPI screw) 22mmX52mm main body. 65mm total length. **** Polished Premium Quality18-8, 304 kitchen food grade Stainless Steel stopper body only. M8 threaded opening in the top center. 23mmX67mm main body. **** Polished Premium Quality 18-8, 304 kitchen food grade Stainless Steel stopper body with removable 8mm(M8-1.25) screw. 23mmX67mm main body. **** Polished Premium Quality 18-8. 304 kitchen food grade Stainless Steel stopper body with 3/8"-16TPI removable screw. 23mmX67mm main body. 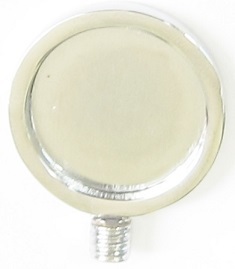 Round Top Mandrel Panel back handle Chrome plated stopper. Stopper main body 25mm dia at top and 70mm in recessed area is 25.4mm D x 3.2mm depth, with flat backside. **** Polished 18-8, 304 kitchen food grade Stainless Steel body stopper Main body 22mmx52mm Stainless Steel cone shaped body and Round top is Chrome plated(Recessed area is 25.4mm D x 3.2mm depth, with flat backside). **** Polished 18-8, 304 kitchen food grade Stainless Steel body stopper Main body 23mmx67mm(without handle) Stainless Steel cone shaped body and Round top is Chrome plated(Recessed area is 25.4mm D x 3.2mm depth, with flat backside). ***Stainless Steel Stoppers with stand in one piece(304 Food Grade S/S. Guaranteed Against Rust and Pits) Stoppers will fit most bottles, including liquor bottles. 23mm dia x 52 mm L. Screws and other accssesories. 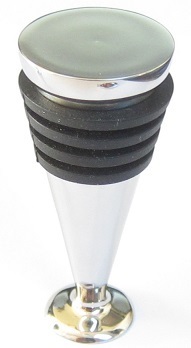 **** Polished Premium Quality 18-8, 304 Food Grade Stainless Steel Stopper with stand in one pieece. Flat top surface for large gluing space. 23mm dia x 52mm L.
**** Polished Premium Quality 18-8, 304 Stainless Steel Stoppers with stand in one pieece. M8 threaded opening will accomodate all screws we stock. 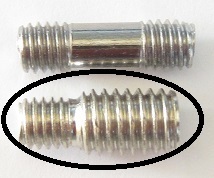 Please see below for screw accessories. 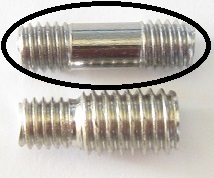 23mm dia x 52mm L.
Additional screws for your stopper: M8-1.25 x M8-1.25(7.2mm true dia)on both ends screw. Fits all stoppers. Chrome plated Round Top. Recessed area is 25.4mm D x 3.2mm depth with flat backside. Our Exclusive: Food grade 304 Stainless Steel Stopper Rack/Stand. Fits all stoppers we stock. 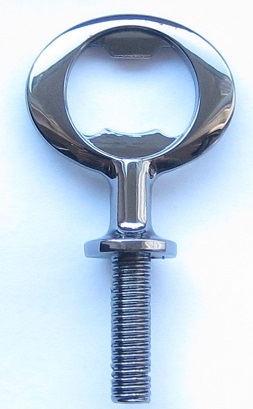 With 3/8"-16TPI threaded stud Chrome plated bottle opener. 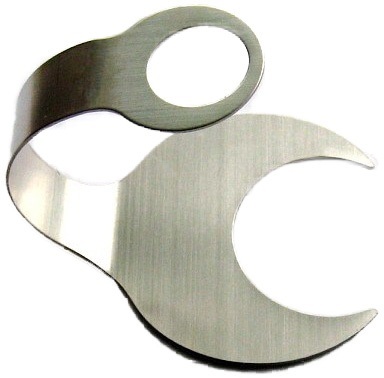 With 3/8"-16TPI threaded stud Gun metal plated bottle opener. Teardrop Stoppers / Droplet Stoppers / Zinc Chrome Stoppers / **** PolishedStainless Steel Stoppers(304 Food Grade S/S. Guaranteed Against Rust and Pits) / Beadable Stoppers. Mini stoppers will fit most bottles, including liquor bottles. They will sit lower. Teardrop Bottle Stopper blank. M8 threaded opening in the top center. Chrome plated over Zinc Alloy. 25mmX70mm main body. 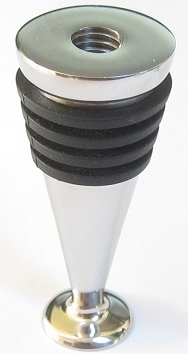 Teardrop Bottle Stopper with Removable 3/8"-16Tpi Screw. Chrome plated over Zinc Alloy. 25mm X 70mm main body. **** Polished Premium Quality 18-8, 304 Food Grade Mini Teardrop Stainless Steel Teardrop Stoppers body only. M8 threaded opening in the top center. 25mm dia X 52mm main body. **** Polished Premium Quality 18-8, 304 Food Grade Mini Teardrop Stainless Steel stopper with Un-removable 3/8"-16Tpi screw. Total length 64mm. 22mm dia X 52mm main body. **** Polished Premium Quality 18-8, 304 kitchen food grade Stainless Steel.Teardrop Bottle Stopper with Un-removable 3/8"-16Tpi screw. 81mm total length. 25mm X 69mm main body. **** Polished Premium Quality 18-8, 304 kitchen food grade Stainless Steel body Main body 25mmx52mm and chrome plated shaft / ball. Excellent beadable stopper. Beadable Shaft is 3mm dia, 30mm beadable length. Ball at the end can be unscrewed. 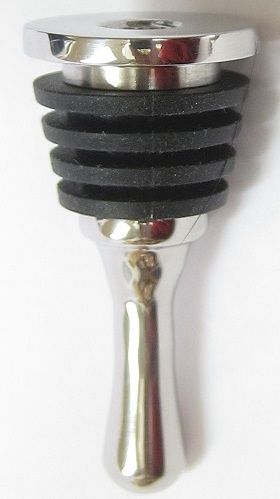 Combo of 1pc Stopper and 1pc Cork Screw(screws into stopper body). Zinc and chrome.